If you’re a dedicated follower of this blog (and hey, aren’t you all? ), you’ll have noticed that I haven’t posted any new recipes for a few weeks. Why? I’m in my last month of pregnancy and I’m wiped out. I know that most new moms will laugh at my exhaustion and tell me to get some sleep before baby comes, and believe me, I’d like to. But between my normal insomnia and pregnancy-induced insomnia, my energy is a little on the low side. 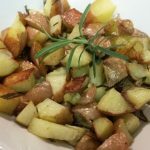 Which is why super-easy and super-quick side dishes like today’s recipe for Rosemary-Roasted Potatoes are so fabulous! This recipe tastes like you put a lot of time and effort into making delicious potatoes, when all one has to do is a quick chop, toss with oil and fresh rosemary, and roast those taters in the oven. Seriously easy-peasy lemon squeezey! I’ve mentioned before that I grow a few things on my balcony garden, and fresh herbs are one of the easiest things to grow! So today’s recipe uses some fresh rosemary, picked just minutes before I used it in this recipe. This quick and easy side dish makes use of fresh rosemary for flavour and presentation. Seriously easy! Line a cookie tray or baking sheet with foil (this makes for an easy clean-up). Chop the potatoes into bite-sized chunks, strip the rosemary leaves off the stalks, and discard the stalks. Toss potato chunks, rosemary leaves, and olive oil together. Spread mixture on foil-lined baking sheet. Bake for 20 minutes or until golden all over and crunchy on the bottom. Let cool slightly before removing from foil and serving. This prevents the deliciously golden and crunchy bottom of the potatoes from sticking to the foil. While I’ve been pregnant I’ve been eating more organic produce than usual, and I’ve found that organic potatoes and organic grapes taste way better than conventionally-grown ones, at least from the stores that I shop at. If you have access to organic potatoes, I recommend using them in this recipe! Otherwise, eh, use what you’ve got! Potato, po-tah-to! 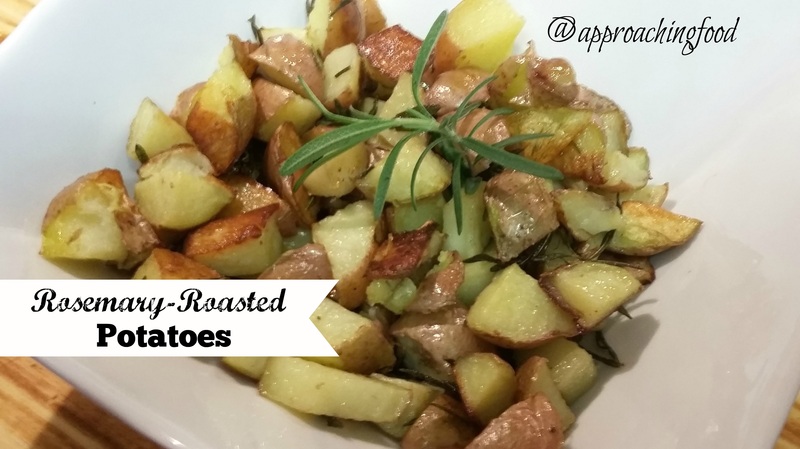 Let me know what you think of these super-easy rosemary-roasted potatoes! I made just enough for the DH and I to have for dinner tonight, but then I taste-tested them…and taste-tested them…and unless the DH gets home soon, there aren’t going to be any for (his) dinner! I mean, hey, I’m eating for two now, right? Next Post: Not sure yet! Possibly macaroni and cheese, either potluck-style or my mother’s style. Or, something else entirely! We’ll see what I’m craving next! This entry was posted in Vegetarian Side Dishes on October 1, 2018 by Margaret. I’ve noticed that you haven’t commented at Prudent Homemaker this week and just wondered if the baby had arrived. If yes, then congratulations – if not as yet – hope you are resting as much as possible. I saw from your comment on Prudent Homemaker that you are having post-delivery complications. First of all, congratulations on your new baby. Second, I’ll pray for you that you get over those quickly, and start to feel wonderful very soon so you can enjoy that new little one! I’m very happy for you. Thanks, Becky! Yes, baby has arrived! Along with complications for me, then for baby, then for me again. But now we’re home and we’re all recovering! Thanks for asking! I do love my Little Miss Poopypants! Congratulations on your little one, Margaret! I’m glad you are both recovering, and like someone said on The Prudent Homemaker, I love that she’s already getting to be in on your frugal adventures :o). Wishing you and your family much joy in the days and weeks ahead.